The Portable Dad: Can he fix it? Yes, he can! When I turned seven (it could have been nine – my childhood memories are fuzzy at best…) my grandpa gave me tools for my birthday. Not toy tools, either; real carpentry tools scaled down for child-sized hands. Grandpa was a carpenter and a welder. He’d actually been a biochemistry student at UC Berkeley until the Depression hit, but had to leave college and ended up working with his hands the rest of his life. I just had another birthday (got a torque wrench this year!) and it made me think of that April afternoon thirty-mumble-odd years ago. I wonder how many seven- (or nine-) year-olds get hammers and squares and saws for their birthday these days? For that matter, how many 19-year-olds have ever seen something repaired? After my stepdaughter had been away at college for a year, I realized that she had very definite ideas about mechanical devices. She believed they should work, work correctly all the time, and that she shouldn’t have to do anything to keep them working. While clearly wrong, I realized that from her point of view it wasn’t an unrealistic expectation. She’d lived 19 years and never seen anything break that could be fixed. She’d only been driving for a year or so before she graduated, and the Toyota she learned on never broke. She didn’t have her own computer in high school. Her electronic devices didn’t break. Nothing ever had. And she’s not alone. I talked with a 28-year-old yesterday about his first car. He bought it at 19, had its required servicing done and when it finally did need a repair he was 26 – and shocked. Even though it makes me sound ancient, I remember when things did break. Our TV, for instance, just periodically stopped working. My dad would pull it away from the wall and pull out the tubes inside the set. We’d go to local drugstore where they had a machine you would plug your tubes into and test them yourself to find the bad one. The cars I learned to drive on needed tune-ups every 3,000 to 5,000 miles, repairs almost as frequently (and one self-immolated in my high school parking lot.) Just by having things break I learned to fix them – and realized that you didn’t have to be an expert to do it. My stepson learned, too. He’s a few years younger than his sister and one day his electric guitar stopped working. “We’ll have to take it back,” he said. “Let me take a look at it,” I said. “What do you know about electric guitars?” he asked. He was wary but reluctantly agreed. So we took it apart and I spotted the loose volume knob and broken wire. Showed him, then had him tighten the hold-down nut to keep the knob in place. I soldered the wire back on. We restrung the guitar and it worked like new. I don’t know about you, but I haven’t experienced a lot of epiphany moments in my life. Had a few and witnessed a few, and that was one I got to witness. It’s better than a birthday. Steve Elliott is an experienced handyman and has been a professional journalist and writer for more than 20 years. 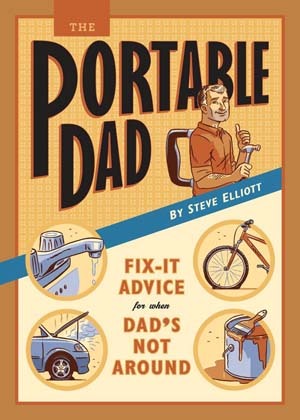 He coached the kids through defragmenting hard drives, checking the coolant in their cars and installing those pesky mini blinds, and shares the essential tips and tricks his book, The Portable Dad, and at www.theportabledad.com. He lives with his wife, Diane, and their two rescue dogs in Avery, Calif.